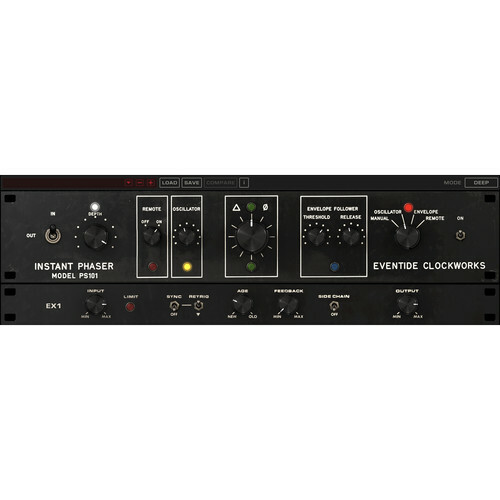 Available for download, the Eventide Instant Phaser Mk II is a plug-in modeled on a famed piece of hardware, one that offers distinct phasing capabilities, as well as stereoizing effects. The original hardware was intended to replace the often tedious effort required to set up tape flanging. What Eventide created is now commonly known as phasing—the act of manipulating the frequency spectrum similarly to how flanging manipulates time. This phaser plug-in boasts a few special features that distinguish it from others, including output routing modes that create interesting stereo effects. Using the Mode selector, you can select among output paths that can make it appear as though your sound is moving through the stereo space. The phaser also gives you more sources of modulation than the traditional LFO oscillator, adding manual, envelope, and remote options into the mix. Perhaps most interestingly, Eventide has not only modeled the original circuitry, but how the electrical components age over time as well. You can use this feature to create creatively warped tones. This software is compatible with Mac and Windows formats. It can operate in AU, VST, and AAX plug-in formats. The Instant Phaser Mk II has a mix knob, but rather than being labeled Mix, it is called Depth. At 0% the output is entirely the phase shifted signal, so you will hear a slight detuning effect. At 100% it is an even mix of the dry and wet signal for full phasing effect. The original, hardware Instant Phaser had two outputs, a Main out and an Aux out. These outputs differ from each other in that one receives two extra phase-shift sections compared to the other. As a result, the Aux output can be considered out of phase with the Main output. If the two outputs are configured such that the Main out is sent to the left channel and Aux out is sent to the right, you will hear a stereo effect. This can sound like the output signal is moving in the stereo field or that it is becoming wider or narrower. Which output path is used by the plug-in can be configured with the Mode setting. While Eventide modeled the hardware Instant Phaser, they discovered certain side effects from the aged components that, while not intended in the initial design, were nonetheless pleasurable. So the company decided to port the pleasantly obsolescent sound into the design with the Age knob. At 0%, the unit corresponds to a newly purchased phaser. Rotate this knob up to 100% to mimic the sound of the hardware's electrical components aging.